Ricky Henderson remains part of the Athletics organization. Among the permanent displays in the Oakland Museum of California's Gallery of California History, a modest space in the "History Now" section hosts the museum's newest exhibit, Homegrown Heroes: Oakland A's at 50, which opened on July 13. The small-scale exhibition celebrates the Athletics' 50th anniversary here with a look back at the careers of Oakland natives Dennis Eckersley, Rickey Henderson, and Dave Stewart and more specifically at the team's 1989 World Series victory over local rivals the San Francisco Giants. 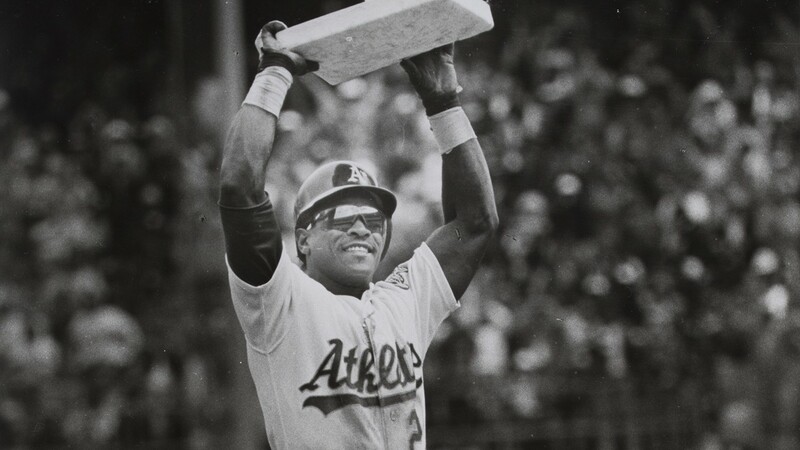 "I hope people realize how deep the A's' roots are in the city — and, in particular, how deeply tied those three players are to both the history of Oakland and to [its] future," said exhibit curator Erendina Delgadillo. After 53 years in Philadelphia and a relatively brief 12-year stint in Kansas City, the A's came to Oakland in 1968, joining the Raiders in the then-newly built Oakland-Alameda County Coliseum. The Golden State Warriors completed Oakland's professional sports triumvirate a few years later. In the exhibition room, in addition to short biographies of Eckersley, Henderson, and Stewart and reproductions of their high school yearbook photos — they attended Washington High, Oakland Tech, and St. Elizabeth High, respectively — there's a display case with Henderson's cleats and championship ring from the historic "Bay Bridge Series," press clippings, and an Eckersley bobblehead. "We have a great history of baseball in Oakland," said A's President Dave Kaval. "Some of the greatest players ever to play for us are from here, which is unusual. They still are part of our organization, and they're still working to bring that next generation of A's players and fans to the ballpark — both at the Coliseum and at our new yard." To the left of the memorabilia display, a magnetic bulletin board spans another wall, on which visitors are invited to put up note cards answering, "What do the Oakland A's mean to you?" Among the responses so far: "Loveable underdogs," "Doing more with less," and "You can be down but you are not out! Go A's." These and a significant number of other comments left on the bulletin board reflect the city's — and its baseball team's — scrappy, salt-of-the-earth persona. What's less apparent in the team's image and mythology is the fact that in recent years Oakland has become decidedly less working-class as an influx of tech and real estate wealth rapidly gentrifies the city. Indeed, many activists fear that the construction of the new stadium could further displace low-income Oaklanders. With the Raiders set to decamp to Las Vegas and the Warriors preparing to move to San Francisco, the A's will soon be the last pro team standing in the Town. Last year, the Athletics organization unveiled a new ad campaign and slogan, "Rooted in Oakland," to demonstrate commitment to finding a new stadium location locally, rather than moving out of the area. Still, A's management has drawn sharp criticism from some corners as they've searched for a new site. For a while, it seemed likely that a new ballpark would be built at Laney College near Lake Merritt, though this plan was met with fierce resistance from many Laney students and faculty, neighborhood residents, and environmentalists. Last December, the Peralta Community College District, which owns the property, chose not to move forward with the ballpark. Remaining possibilities include the Howard Terminal near Jack London Square and the existing Coliseum complex. Back at the OMCA, though, it's all love for Oakland's hometown sluggers. Capping off the exhibit are a reel of footage from the 1989 World Series, a Battle of the Bay poster from that same year, and several A's-themed books for visitors to flip through, including Holy Toledo: Lessons from Bill King, Renaissance Man of the Mic by Ken Korach and Home Field Advantage: Oakland, CA - The City that Changed the Face of Sports by Paul Brekke-Miesner, who Delgadillo said helped plan the display. Since the exhibit is almost entirely devoted to the 1989 World Series, some visitors may notice a conspicuous absence of information about other notable periods in A's history. Aside from acknowledging that the A's arrived in Oakland in 1968, there's no hint of what the pre-California Athletics were like, or how a city then roiling with political, economic, and social upheaval greeted its new ballplayers. Nor is there any mention of the A's' historic triple back-to-back World Series victories from 1972 to 1974, or of the 2002 season, memorialized in the book and film Moneyball, during which the A's front office used statistical analysis to best utilize its shoestring budget to compete with wealthier teams. What's more, despite the gallery's "History Now" moniker and a wall proclaiming, "History is happening every day, and you are part of shaping it," the current A's are nowhere to be seen. Delgadillo explained that when planning the display, the museum considered several other significant A's periods, but settled on the 1989 World Series because "it was a really important moment for the Bay and it was the first time that a team from San Francisco and a team from Oakland faced off in a World Series."